‘New Stasi Agency’ does have the powerful ring of truth to it. However, Paul Craig Roberts may wish to update the nation further on the state of affairs today, which has regressed from mere spying on cellphones–in a mass spying program which NSA recently moved quietly to close down, or say they are closing down–to brutal hacking of brains and bodies. Keeping America in the dark–as mainstream media has long been doing and continues irresponsibly to do–about the current and ongoing use of deadly anti-personnel Electronic Warfare and Neuro Surveillance weapons on Americans (as also on people worldwide, through the Global Gestapo established by the NWO) is doing this country a great disservice. We need to ask: Are we going to let our kids and grandkids be enslaved by this covert radiation neuroweaponry for life–by simply not speaking openly about it? For violence today has many faces, and many perpetrators. 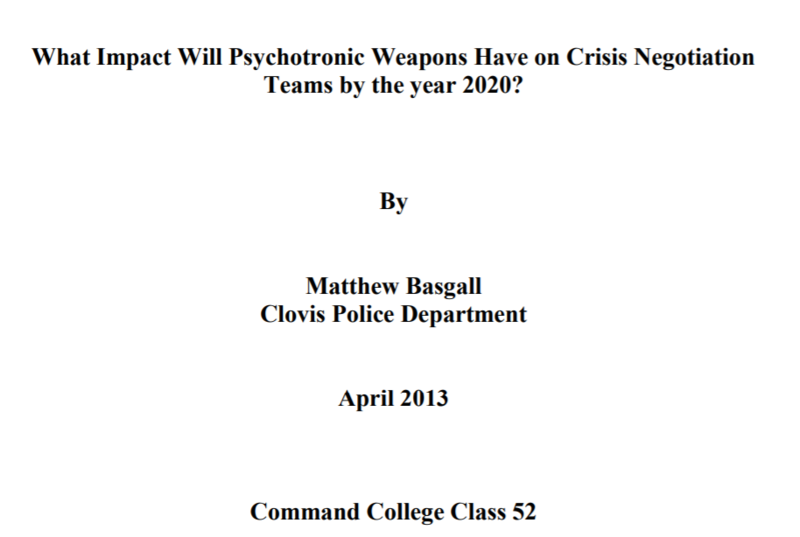 The stage for the covert use of non-lethal weapons on the populace has been set by duplicitous means, including the use of Authoritarian Psychiatry. But let us examine how violence has entered the picture today, and how the NSA has enacted this violence on Americans, inside America. One form of violence is psychological terrorism and subjugation, inclusive of mental health labeling and physical stalking. No doubt such spying and stalking of NSA by NSA is Stasi and SS-like, it is also markedly similar to COINTELPRO run by Hoover and his men on politically active groups and continued today in the grand Mafiosi tradition of the modern FBI, and echoed as well by the JTRIG Deny, Disrupt, Discredit of Intelligence agencies running cyber-interference on the Net. 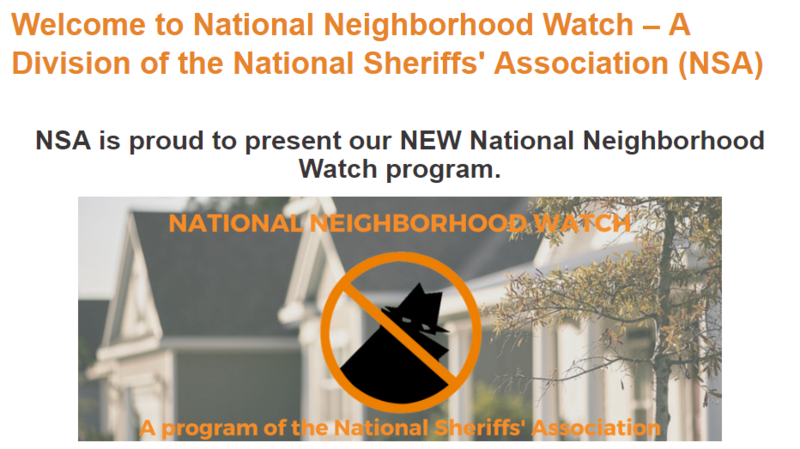 “See something, say something” is also what the DHS urges today–as also the National Sheriff’s Association which organizes Neighborhood Watch Groups, and they could not go far without the obliging services of the FBI in stepping blithely into neighborhoods armed with falsified records, falsely-acquired court-notifications, false narratives and fabricated labels and aiming to tar and smear anyone of stand-out integrity, conscience, eloquence, or spine for use, abuse, and stamping-out in targeting, stalking, and trafficking into non-consensual military and University projects—involving New Age neuro and military stealth weapons, all enacting violence—and absolute life-sabotage. Character destruction is life destruction: it leads to social isolation and employment blacklisting, rental/real estate blacklisting and life-sabotage. That’s social terrorism and violence both, of a rather insidious kind: no bleeding wounds but utter destruction of a person’s life, possibilities, career, potential. That Non Lethal Weapons are being used en masse on the American populace today is not a matter for dispute and is discussed further below. That the NSA is involved comes to us from whistleblowers. Karen Melton-Stewart, NSA whistleblower, has narrated how the inexplicable retaliation leveled against her for launching an EEOC lawsuit and asking for the rightful fruits of her labor with full retirement benefits, post her internal whistleblowing about internal corruption and sexual-favor-initiated-promotions evidenced in her department by top NSA management led to her becoming the target of inhumane EMF/Neurotech attacks with remote directed-energy weapons, the counter-personnel Stealth Assault Weapons newly entered into the arsenal of the FBI and local police through military agreements in the ’90s, such as the 1994 Memo of Understanding signed by Attorney General Janet Reno and Secretary of Defense John Deutch—preceded by the 1993 NIJ Initiative in Developing Less-Than-Lethal devices inclusive of laser, microwave, and electromagnetic weapons. Violence in Silence—With Proven Stealth Assault Weapons, Coming Now Openly to Police Departments? This is physical violence, and this is a leading NSA whistleblower reporting the use of violence on Americans, internally in the USA; the use of Stealth Assault Weapons such as microwave weapons, sonic weapons, scalar weapons, and covertly-implanted RFIDs or bioweapon systems which project “Silent Hits” on people remotely–hinted at in this ACLU report on the FBI’s terrorism watchlisting process–using invisible radiation/plasma/sonic projectiles does not make them any less violent, assaultive, invasive, intrusive, or forceful, as their euphemistic military label “Non Lethal Weapons” might falsely and palliatively invite anyone to think. The more accurate term for them, I would contend, is Stealth Assault Weapons or Bio Hacking and Neuro Hacking or Brain Hacking weapons: using bio-resonance frequencies against people, they target human organs, joints, nerves, muscles, bones, and brains, they attack health, vitality, fitness, and mental prowess, they destroy, degrade, disrupt, and deceive humans. And while overtly, public disclosure of these weapons by talking heads, researchers, Intel agencies and mainstream media is still carefully attenuated as seen recently in the debacle of the Cuba and China diplomatic personnel attacks where talk of the “mystery” went on forever, it appears that such disclosure is being stepped up–and not necessarily with beneficent intent–with the eventual mention of microwave radiation effects by Dr. Beatrice Golomb, Professor of Medicine at University of California, San Diego, and microwave weapons by the NY Times, after which experts who were called in like James Giordiano, self-confessed US military neuroweapon creator, also admitted to the existence of same. 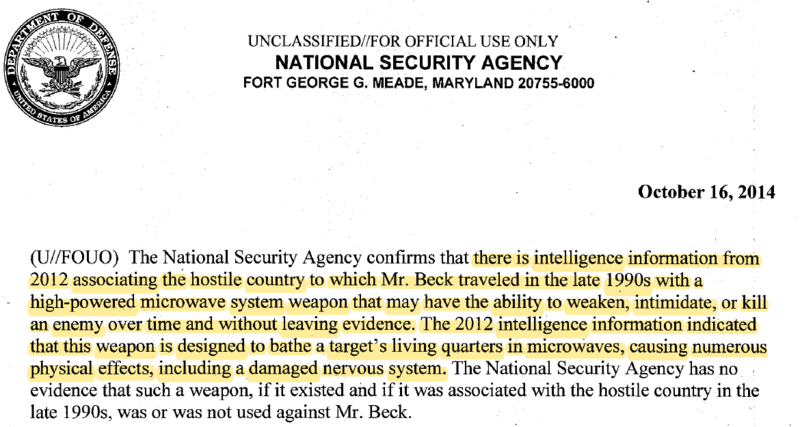 Momentously, given the decades of US Government silence, denial, and refusal to acknowledge this new form of attack on humans, it appears in fact that psychotronic weapons or neuroweapons–which have apparently been in field-testing for over two decades on Americans, as per published NIJ (National Institute of Justice) annual reports which only refrain from naming them as such, referring allusively to “advanced technology” while acknowledging “laser, microwave, electromagnetic technologies”–are now being openly and seriously considered for inclusion in local police arsenals. The evidence for this possibility comes from a rather extraordinary document, also freely available online and recently sent to this writer by researcher Dr. Millicent Black. 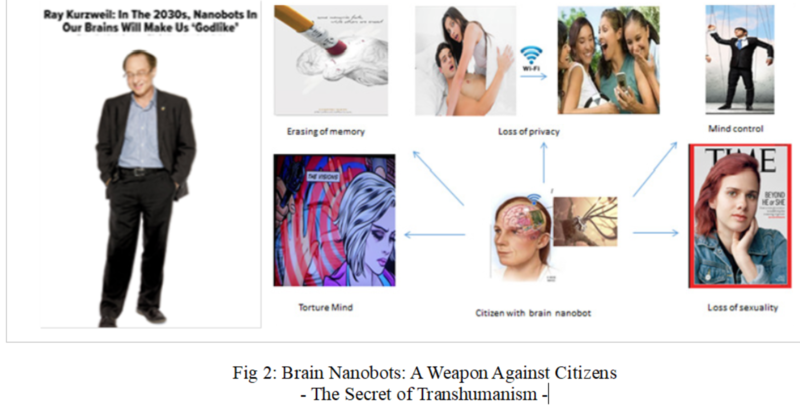 Notably, military Voice to Skull technologies and other brain manipulating neuro-technologies including radio frequency neuroweapons to instantly put hostage-holders to sleep, are mentioned in this article (which will also be reported on separately here, shortly). 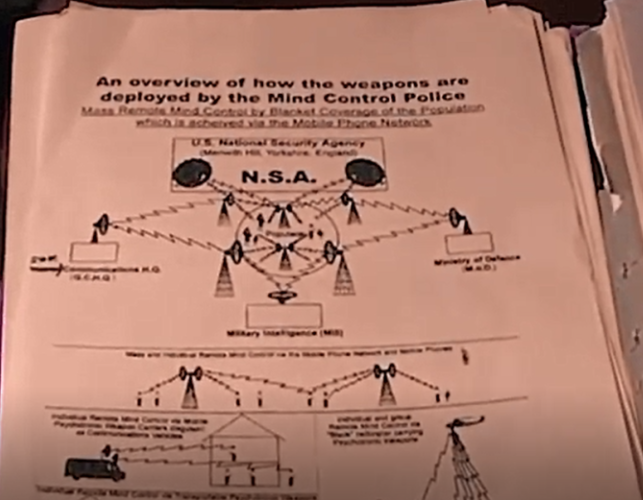 On this subject, it is also apposite to mention that further revelations of NSA involvement in radio-hypnosis neuroweapon programs, often exclusively attributed to the CIA, post the MK ULTRA discoveries of the Church Committee Hearings in the ’70s, have been published online by whistleblowers. It should be known widely also that weapons of brain degradation are today slowly being revealed by the US Military–always of course within the simulated framework of America needing to defend itself against other countries’ usage of such weapons on Americans. Then consider the monitoring and probing of human brains for Surveillance, which apparently the NSA has been doing remotely for decades. 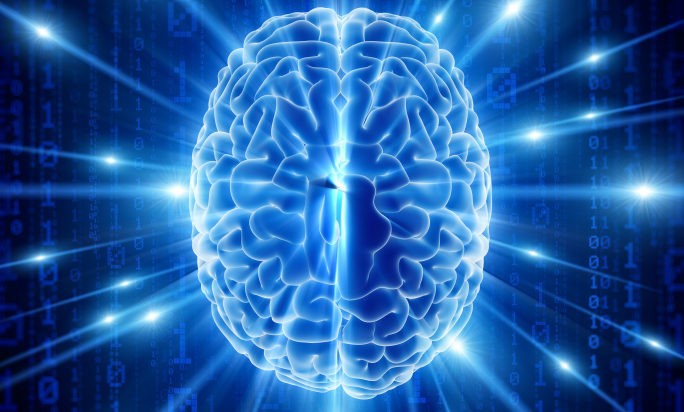 Is brain probing invasive or non-invasive, violent or non-violent? In 1992, John St. Clair Akwei, an NSA employee, filed a lawsuit against the NSA, wherein he described in quite detailed fashion how the NSA non-consensually probes brains remotely with EMF energy, monitors brains continuously with Remote Neural Monitoring, reads brains, modifies brains, and generally engages in invasive, neuroethics-defying stunts to the nth degree, aggressively bombarding its targets with “electronic harassment” and brain frequencies designed to destroy. Neuro-modification via assaultive, damaging brain frequencies, many would contend, is violence. This lawsuit has been freely available on the Internet for at least two decades now, and details a system of remote monitoring that the NSA has apparently been engaging in for ages. Other lawsuits and affidavits implicating the DOD and CIA in torture programs involving non-consensual implants, WBANs, and remote access and assault of bodies can also be found online, case in point the Charles Schlund affidavit, and the David Larsen report. Alse see the Richard Cain lawsuit and the James Wahlbert lawsuit. 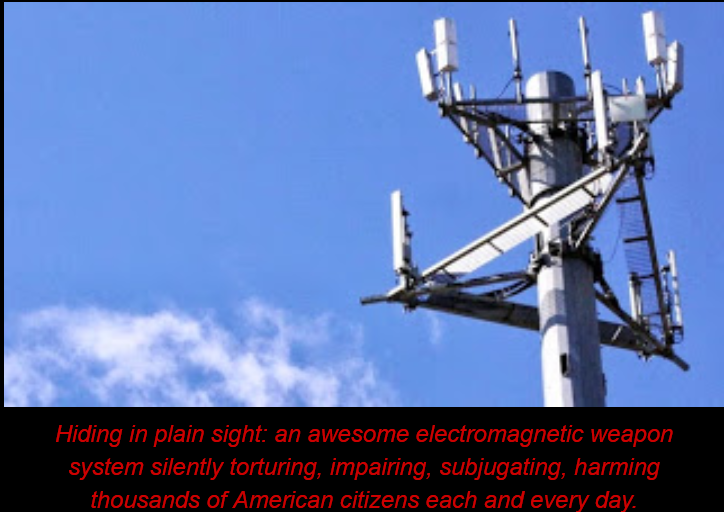 Further: Over the past three decades, hundreds if not thousands of people have been reporting violence enacted on their persons with electromagnetic weapons, applied at a distance, acting from a distance, but impacting intimately on their bodies and brains. These reports can be found all over social media, in videos on Youtube, on personal blogs and websites, in books and articles, and in frantic, hope-filled petitions, letters to Congress, memos to Congress, including this 2017 Memo to President Trump and Karen Stewart’s synopsis of the Silent Holocaust smoking in the Heartland, now enduring the Nazi label of “Homeland”and being co-opted and corralled into Stasi See Your Neighbor, Record Your Neighbor shenanigans up and down the continent from the Great Lakes to the Gulf, Sierras to the Appalachians, Pacific to the Atlantic—and exported in identical guise, well beyond these oceans to all the pulsing world. Former Technical Director of the NSA Bill Binney has now been apprised of these crimes by Americans, as have other prominent NSA and CIA whistleblowers such as Thomas Drake, Kirk Wiebe, and John Kiriakou. A worldwide survey was initiated a year ago by American human rights activists Cait Ryan and Karla Smith concerned about the horrific human rights abuses being reported both within the US and worldwide; this was endorsed by Mr. Binney and Mr. Wiebe, two NSA whistleblowers who took an interest in examining these abuses and studying the voluminous evidence in photographs, medical imaging, radiological scanning reports provided by those reporting 24/7 assault on their persons with EMF radiation and sonic/scalar/nano neuroweapons. Preliminary information about the survey results were published here; further information is yet to be known. It is possible therefore that Mr. Binney made the cited comment at a time when he was personally unaware of the extreme human rights abuses being reported by Americans just as much as people outside this country. No journalist today can ignore all this evidence. But there is as we know a massive Cover-Up Op ongoing, and the only reason it holds sway over the minds of the deceived public is the enormous reach of the lying, deceiving, Government propaganda-pushing mainstream media edifice. So really, the act of repeating today, without comment, that the NSA “(is not) getting violent yet that we know of–internally in the US” adds to that Cover Up, and becomes nothing less than a wilful turning from the inundating thousands of reports from desperate, pleading Americans reporting the torturous, 24/7 use on their bodies of pulsed microwave weapons, ELF weapons, Radio Frequency organ-destroying weapons, and Satanic, neural play in their heads of dark military bio-communications technologies such as V2K, synthetic telepathy, EEG heterodyning, and Brain Computer Interface brain-hacking weapons and bio-robotizing weapons. And even that is only the tip of the iceberg because it appears WBANs, neurostimulators, nanotech implants, self-assembling nanotech, direct contact weapons, chemical weapons, biological weapons, and psychological weapons are all also being used on people today, in mass experimental projects or small exclusive studies—very much inside the US (just as much as abroad) and most emphatically involving the infliction of pain. Many reporting cases can be found in my own articles and print and video interviews at The Everyday Concerned Citizen and Ramola D Reports on Youtube. Books by Dr. Rauni Kilde, Renee Pittman Mitchell, Mark M. Rich, Dr. John Hall, and Dr. Robert Duncan, and detailed websites by Cheryl Welsh, JD, Paul Baird, LLM, Soleil Mavis, Harlan Girard, Dr. Eric Karlstrom, others, spell out the carnage. Books by many reporting their personal experience of assault with these weapons and technologies also abound; Dr. Corkin Cherubini, Mary Gregory, Michael Bell and many others have written eloquently of their basic human rights being so violated. Several human rights organizations have formed, here in the US and abroad, to address these crimes, which the apparently co-opted and complicit ACLU and Amnesty International and Human Rights Watch will not touch: Citizens Against Harmful Technologies, Targeted Justice, Targeted America, ICATOR. In a new series examining the commonalities between today’s EMF/Neuroweapon targeting tortures and classic CIA/DOD torture, Dr. Millicent Black and I have looked at US Code definitions of Torture, at former President Bill Clinton’s disavowal of torture, and at Physicians Committee for Human Rights’ reports highlighting the role of medical professionals and psychologists in devising modalities for torture, quite in contravention of Hippocrates oaths and basic morality. Today it is specious therefore and false to suggest that the NSA—or any other ABC agency—is not engaging in brutal, sadistic, and violent electromagnetic surveillance of its citizens; not merely is the surveillance violent, it is an open door to racketeering operations via trafficking watchlisted unfortunates (wrongfully, fraudulently watchlisted) into cannibalistic and hugely unethical military and Intelligence programs of directed energy weapons-testing, unethical and inhumane research into the “bio-behavioral” effects of such DEW testing, unethical, inhumane, non-consensual neuro-experimentation, unethical, inhumane, non-consensual medical/disease research involving telemetry and nanotechnology, and unethical, inhumane, non-consensual social engineering, behavioral modification, and neuro modification projects which are both supremely invasive, involve health destruction, life destruction, family destruction, and the social isolation, ostracizing, stigmatizing, and labeling (as schizophrenic, schizoid, delusional, and paranoid) of targets used non-consensually as test subjects. In fact it is fairly clear to all those reporting such extreme assaults on their bodies and brains that the “Do No Harm” directive of Hippocrates which may have been sincerely meant once upon a time by principled medical students taking that oath no longer applies as far as medical professionals associated with the US Air Force, US Navy, Air Force Research Labs, NSA, DARPA, CIA and other weapons-testing military divisions are concerned, nor any private companies contracting with same, including Universities, hospitals, and research institutions. Clinical researchers using EMF/Sonic & other stealth technologies non-consensually on the bodies of people today have replaced Do No Harm with Do Maximum Harm, as the numbers of thousands of reporting victims, many pushed to suicide or experimented on until maximum bodily damage and death, can attest. Reports of deaths from targeting (found here and here and here and here and elsewhere online) with these deadly technologies span decades and continue to the present day. Wrongful—indeed permissive, extravagant, profligate–watchlisting today by fusion centers and corrupt local officials have resulted in hundreds of thousands of innocent, non-criminal, non-terrorist Americans being watchlisted as “known or suspected terrorists” and “non-investigative subjects,” all of whom are then permissively, illegally, and unlawfully trafficked into military and Intelligence contracts whereby they are kept under 24/7 surveillance, monitoring, and assault with RF technologies—while being publicly observed, monitored, surveilled, and stigmatized while being so assaulted in wrongful “Behavioral Research” programs. 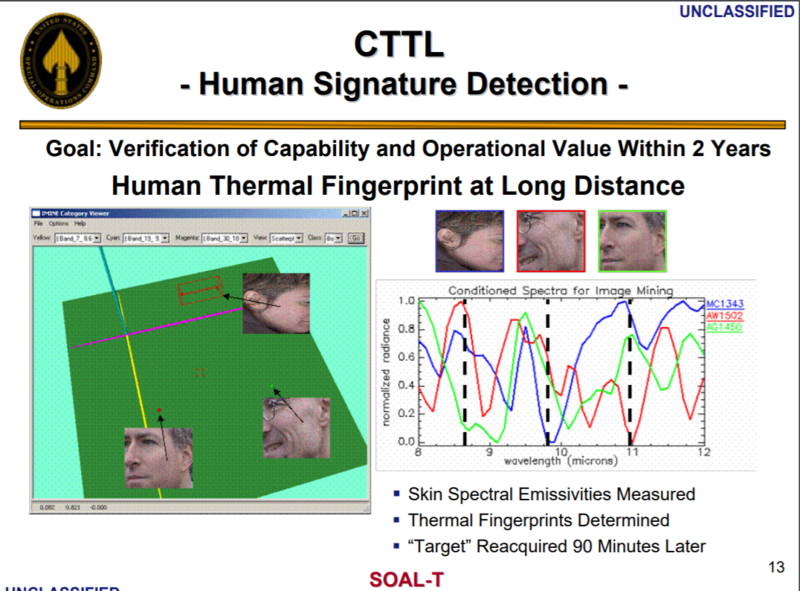 The fact that RF/other stealth technologies are being used on US streets today is being kept silent by the treasonous coterie of Fusion Center agencies; however, the fact of US DOD/DOJ exploration, research, development of “less-than-lethal” and “psycho-corrective” technologies which include laser, electromagnetic technologies is known. Nor is there any clarity from the FBI’s TSC as to why watchlist names are being submitted to police forces at Universities and hospitals and private security agencies, for what purpose. Is this also the means whereby researchers at Universities, Department of Defense, and other institutions are being given the names and details of those watchlisted, to non-consensually experiment on? In this regard, the testimonial of thousands of those reporting targeting crimes becomes crucial: most report being persecuted by 1) multiple relay-stalking groups who variously take up residence in their neighborhoods, harass them on roadways, and assault them with RF/acoustic technologies anywhere they travel; 2) they also report being treated rudely or being overtly monitored by retail businesses, as well as 3) being stalked by local police, campus police, Fire, and EMS vehicles, as well as 4) being overtly subjected to continuous public aerial stalking with small planes, drones, and helicopters. 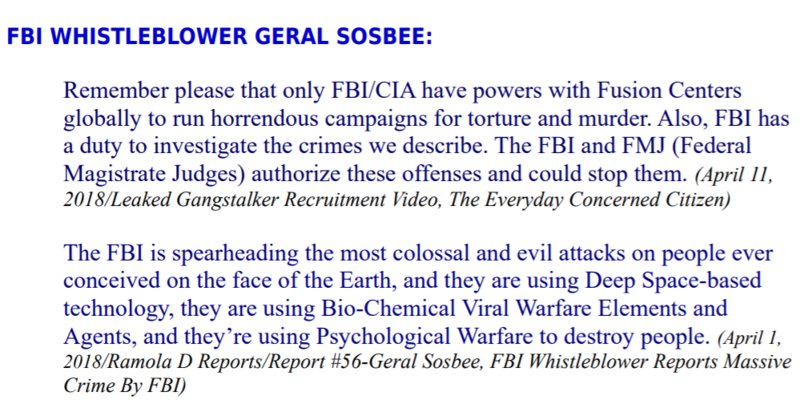 FBI and NSA whistleblowers Geral Sosbee and Karen Stewart also testify to FBI/NSA involvement and a vast private-sector network contracting with fusion centers to run COINTELPRO and Stasi operations on Americans. Geral Sosbee has opined that this enterprise is commandeered by the FBI. Karen Stewart has written extensively on the involvement of the FBI and other Federal agencies in the targeting, persecution, and murder of citizens. Barbara Hartwell, CIA whistleblower, has also written extensively about Directed-Energy Weapon use on Americans and spoken of the unConstitutional domestic operations of the CIA and FBI in domestic persecution activities against citizens. Former NSA Technical Director Bill Binney has previously spoken of the deleterious impact of public-private partnerships, openly acknowledged by DHS, which has now also established liability protections for the manufacturers of “anti-terrorism technologies” with the SAFETY Act. Journalist Vic Livingston has exposed the primary role played by behemoth Defense contractor Lockheed Martin in running “gangstalking” operations in all 50 states and operating a command center Electromagnetic grid for EMF harassment and persecution of all being targeted. The US Government has acknowledged that hundreds of thousands of names are added to the watchlist as “known or suspected terrorists” every year, even though they will not disclose the exact number. It is time therefore to wrap up the wrongful operations of “Surveillance” which basically open wide the door to racketeering, trafficking, revenge operations, non-consensual military and Intelligence experimentation and wholesale assault of the citizenry with stealth assault weaponry under guise of all manner of covers, including research, criminal justice, and national security, while essentially inflicting massive violence, in secret, on the American and worldwide population. To this reporter, it appears the only terrorism occurring in America today is State-run, the only need for oversight is of these illegal public-private and militarized Surveillance programs which are executing extreme human rights violations on the populace. America has become a cesspool of Crimes Against Humanity, and the agencies culpable are the NSA, CIA, FBI, DHS, and DOD—among other Federal agencies, no doubt—those who created and operate the “threat fusion centers” and arbitrarily name anyone they want a terrorist. This reporter can testify that all interviewees (recorded at Ramola D Reports and here at EverydayConcerned.net) reporting Surveillance abuses of this extreme nature—which clearly involve repression operations and non-consensual military/Intelligence experimentation and constitute Torture–are people of integrity and accomplishment, both innocent of the kind of crimes that Surveillance Watchlisting accuses them of (suspected terrorism), and in actuality often extraordinarily civic-minded and community-minded people whose courage in speaking out against fraud, waste, abuse and corruption brings them to the notice of corrupt criminals occupying positions of power in fusion centers or with connections to same, who revenge-watchlist and human-traffick them. Numbers of articles, some listed below, attest to this scenario. Readers are advised to research all articles and interviews at this site, to understand the nature of Surveillance abuses and the need to end these horrific crimes against humanity being paid for by the taxpayer and run under cover of Surveillance and National Security by amoral, duplicitous, and flagrantly treasonous managers of fusion centers. Violence in Silence is the norm today, and the NSA, along with the other government agencies and private corporations practicing this unconscionable violence on Americans must be stopped in their tracks. 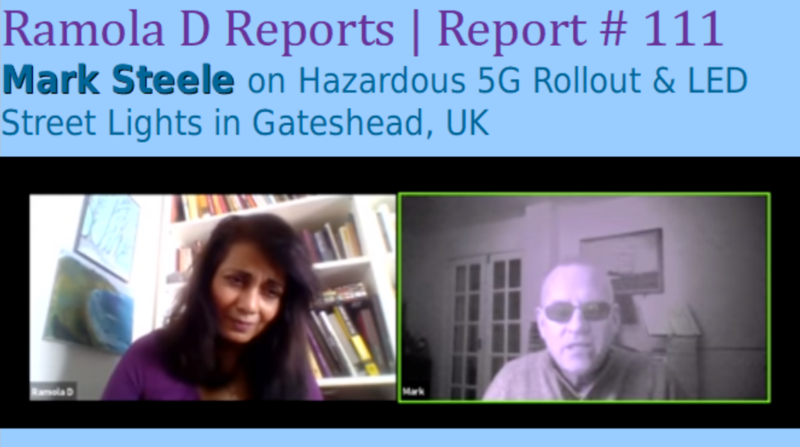 In a powerful and technically insightful conversation aired at Ramola D Reports on January 22, 2019, Mark Steele, technical weapons expert, patent writer, inventor, nuclear research technology officer spoke forcefully about the dangers of 5G and the recent LED Street Lights rollout in Gateshead, United Kingdom, which he says is part of the 5G rollout. Telecom companies selling 5G online and mainstream media also selling 5G online note this property of 5G on numerous websites, videos and broadcasts touting the advantages of 5G, which they say will not merely increase speed of cell phone communications “10 to 20 times faster than the fastest mobile networks today” (5G for Dummies/Qorvo.com) but will reduce time taken for data transfer on your cell phone–known as latency–and become invaluable in all processes requiring supra high-speed communications, such as robotics surgery, remote medical services, EMS, connected-object communications aka the Internet of Things, Virtual Reality immersive experiences, and self-driving or autonomous vehicles. Image: Screenshot/BBC Click: What will the future of 5G bring? What these telecom companies and mainstream media outlets do not cover however are the human and organic bio-effects likely from 5G. What will be the cost of 5G in human health? Mark Steele points out that the science is clear, that high-frequency radiation will cause immense harm to human health. Using graphics from telecom companies detailing the ways in which 5G’s wifi signals will be transmitted from antenna to receiver on the street, Mark describes the tram-like system which will be used to orient and propel autonomous vehicles down the street. Antenna systems located on street lights would be part of this network, pulsing passers-by, residents, drivers, walkers, and shoppers with unhealthy amounts of high-frequency radiation. 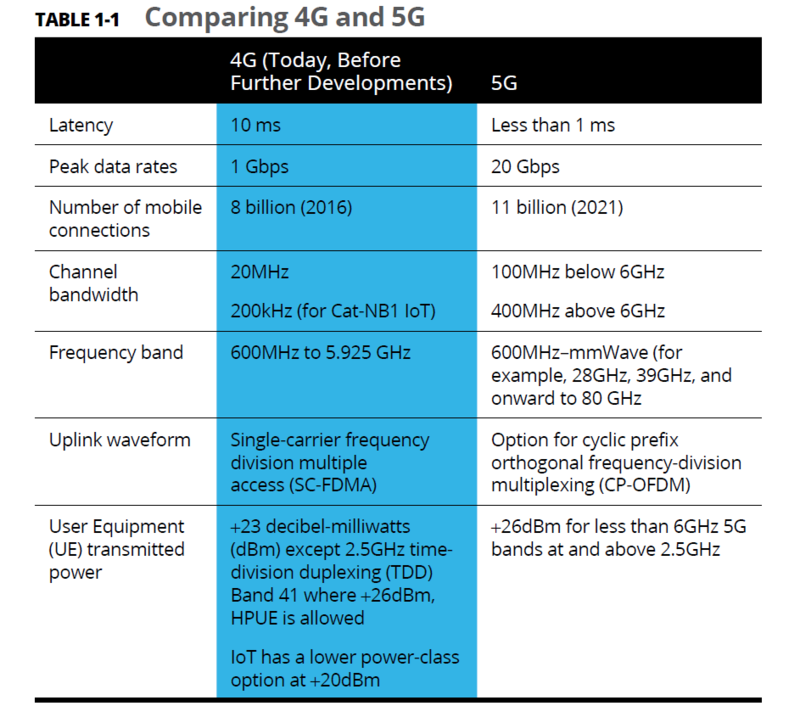 Operating in the invisible part of the electromagnetic spectrum across a wide range of frequencies, 5G, much unlike the mainstream notion positing the 1-300 GigaHertz range for its domain, operates actually in the subGigaHertz range, Mark notes, from 400-600 MegaHertz and upward. Specs for the LED street lights mounted now on poles in Gateshead suggest an 800-875 MHz, definitely within the 5G range, he says. 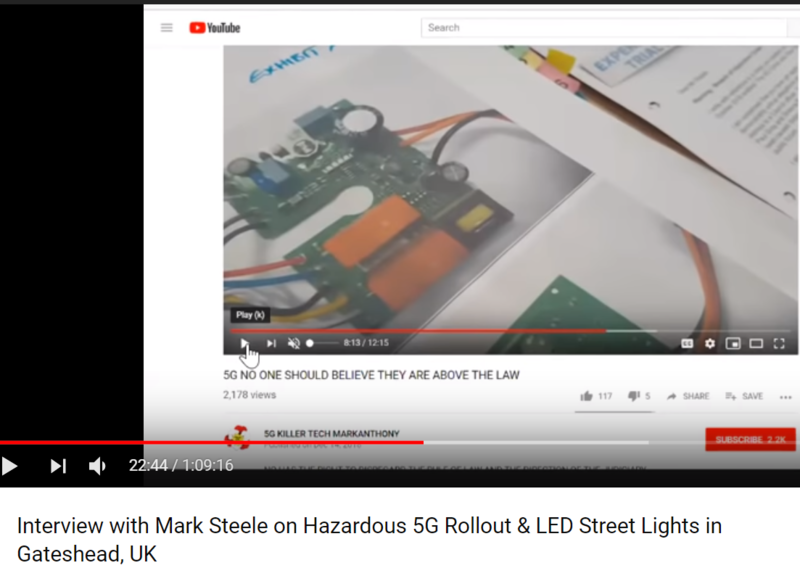 In a short video reporting his notice to the Council about crimes against humanity being committed by unsafe installed technology affecting the public, Mark Steele observes that the light from these lamps harm children’s retinas, citing a recent UK Health report by Public Health England on LED flicker rate being harmful to human eyes. Gateshead County Council members deny that the LED lights installed in Gateshead which are indeed equipped with control-system wifi antennas at around 860 MHz comprise an undisclosed 5G rollout, and have alleged that Mark Steele is fearmongering and harassing the city council with his information on 5G, a notion thrown out recently in Newcastle County Court by a judge who recognized that Mark Steele is a technical expert who has done relevant research on this subject and needed to be heard. 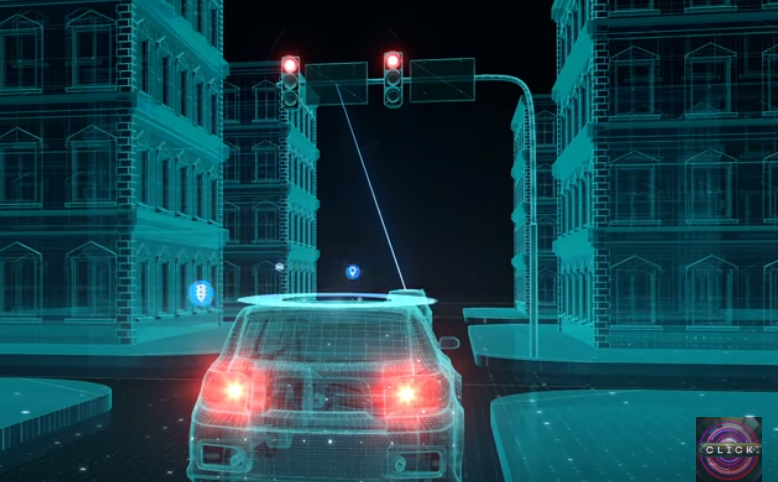 It should be noted that the intended use of 5G for autonomous vehicles does envision the projection of 5G from street lights and traffic light frames noted in graphical descriptions as in this BBC video on 5G. Offering a close study of the antenna system hardware mounted on street lights, Mark Steele notes that the complicated chipset and dielectric antenna lens denote “beamforming,” a weapons capability “used in battlefield interrogation” which is now being brought to the streets. IEEE, in a video describing 5G, explains that “beamforming” is indeed an aspect of 5G, a means of sending directed millimeter wave radiation directly to a target, such as for instance, a cell phone. But what it implies also, says Mark, is the capability to direct a precision beam of high-energy pulses at a human–such as the human holding the cell phone or any humans in the way of the transmission. The biological effects of this intense radiation on humans must be known–and there is already a lot of information from scientific studies about the harm caused to humans by wifi radiation. Anyone can hack in, Mark says. Illustrating how this non-visible high-frequency radiation is essentially Surveillance Radar which can be used to see through walls and houses (utterly destroying privacy, and indeed breaking extant laws on privacy), he suggests that this technology could be hacked into by revenge-seekers and used against anyone in a targeted way. Interestingly, he notes, wifi-equipped street lights are manufactured mostly in China and Taiwan. These are weapons systems, he notes, coming to the West from China; what are they doing in Gateshead, UK? 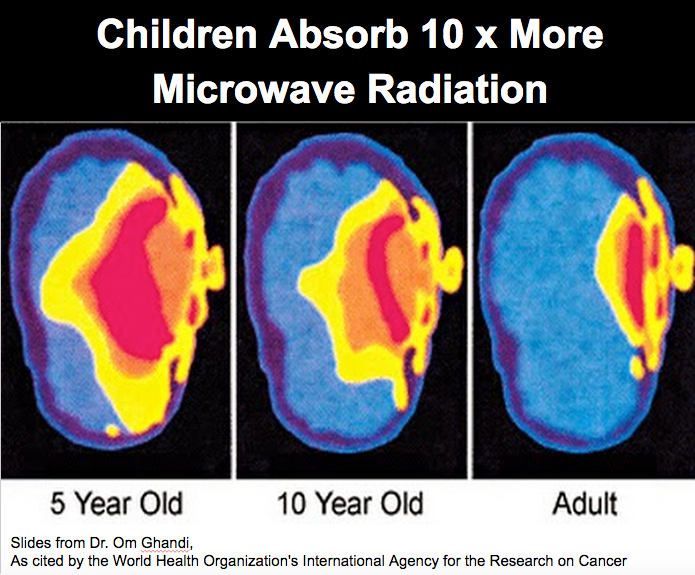 Children especially would become vulnerable, as studies of wireless radiation impacts on brains already show, with higher absorbency and spread of radiation visible in brain MRIs of young children. Despite the existence of hundreds of studies detailing harm, and hundreds of scientists coming together to speak out against planetary rollouts of 5G, telecom companies and city councils are paying no attention to the warning signals from data and are racing ahead with plans to install 5G in cities, breaking laws on privacy and public safety to do so. 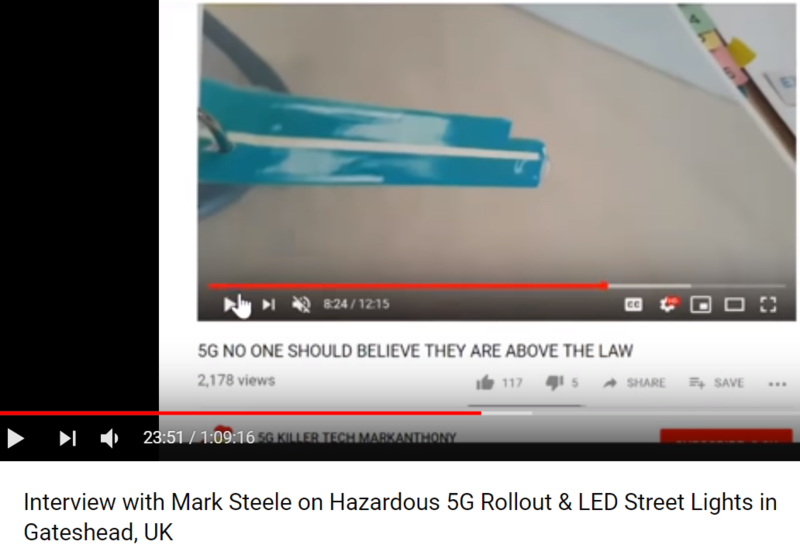 They will only be stopped through public outcry, and public action, says Mark, which is why he is keen to spread solid information on 5G to all. His latest report on trees being cut in Gateshead—beautiful old stately street trees–to accommodate the 5G rollout is particularly unsettling. IEEE notes that the extremely short-wavelength radiation of 5G is absorbed by rain and trees, as also large buildings (necessitating the installment of multiple small-cell masts in residential areas and cities). Is it for this reason that trees are being removed on city streets? Please see this latest video from Mark Steele depicting the ruthless cutting-down of trees. Installations on the sides of houses, for instance are illegal, Mark notes, because they would pose an extreme health hazard, flooding the bedrooms of children and adults with harmful pulsed high-energy radiation. 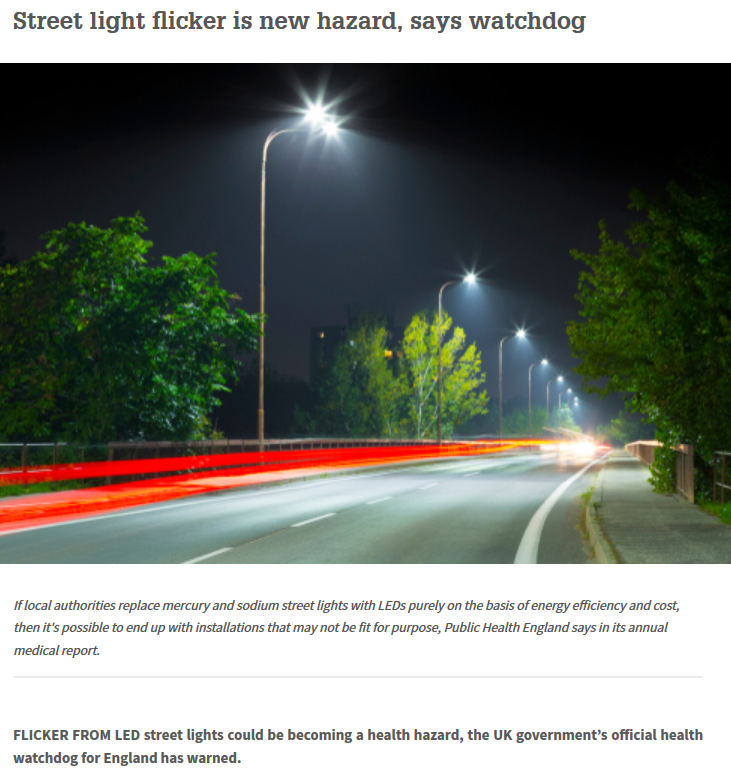 Similarly, installations on street lights and on the multiple “small-cells” envisioned by 5G rollout maestros would flood residences—all human homes in cities—with pulsating, organ-damaging and brain-damaging radiation, destroying cognitive processes, impairing health, vitality, and fitness, and plausibly transforming healthy city-dwellers into chronically ill, brain-damaged “patients” needing permanent rescue from the medical services and pharmaceutical industry. Children in Gateshead have reported nosebleeds, Mark notes, right after the new street lights were installed, and incidences of miscarriages have occurred; Mark Steele also points to the increase in sudden infant deaths in recent years. Are these the first warning signs of a public health disaster? 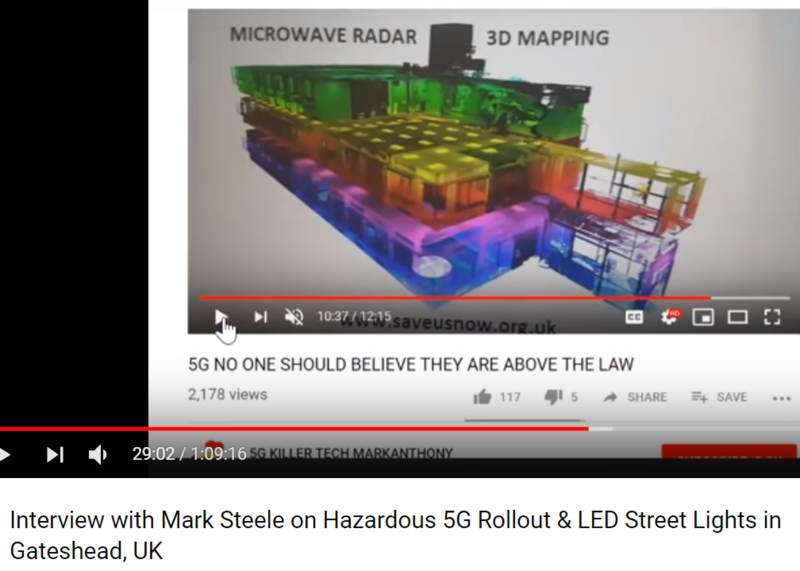 Our children and grandchildren—and those politicians’ children—WILL die, warns Mark Steele, if we permit 5G to be installed. This is a weapons system, it will bring genocide and sterility. Do We Really Need Autonomous Vehicles Running On 5G? 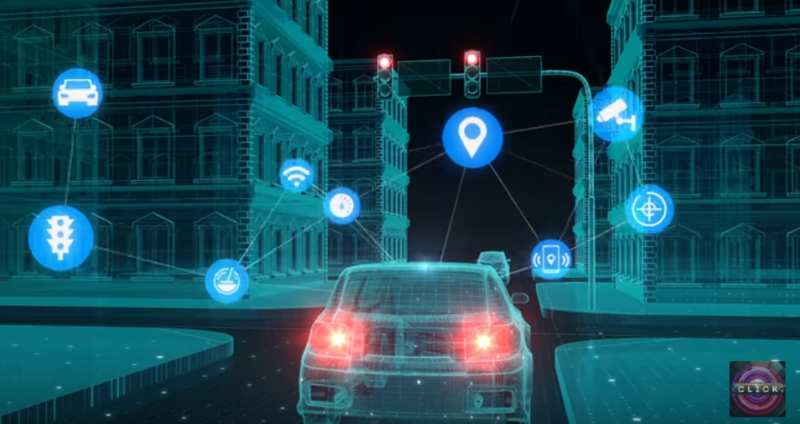 An important question for all city-dwellers to consider is: Do we really need autonomous vehicles run on Machine to Machine communications, AI, and high-energy pulsing 5G? Or would we prefer to safeguard humanity for future generations? A passionate activist committed to informing people about the dangerous health effects of an untested wireless technology which promises more harm than good, and which he says is essentially a covert surveillance and weapons system likely to effect mass death and disease, Mark suggests that everyone make the effort to become informed about 5G and join the worldwide human rights fight to stop this rollout. 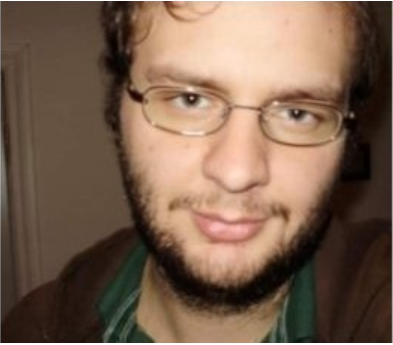 As he prepares to once more go to court to respond to charges of fearmongering, Mark asks for people to help support his legal battle and intellectual battle to inform humanity. Mark Steele has set up a website Save Us Now where all are invited to download FOI request templates and start questioning their local Council members. Every one needs to come together to educate Councils and cities, counties and states, he says. 5G should not be permitted to be rolled out, since it will spell the death of humanity. 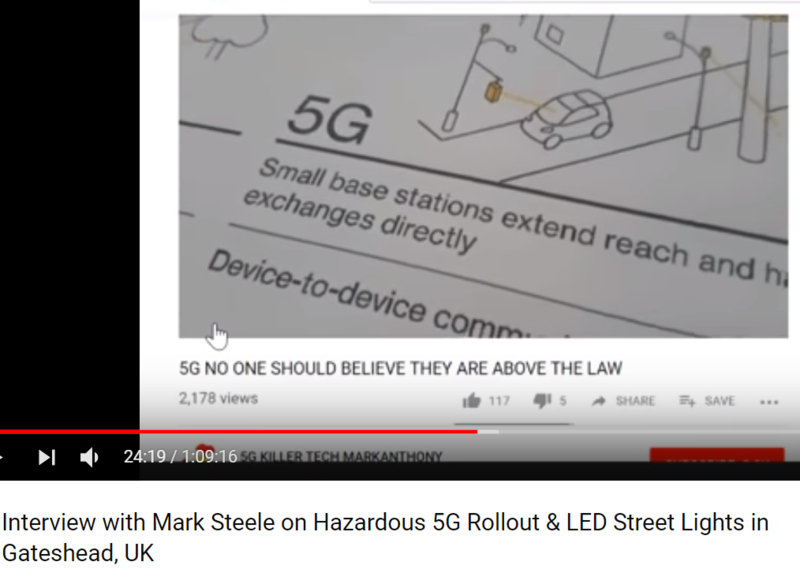 Please watch the videos below as well, from his channel, research 5G further, and join this major fight to save all of our lives, and most especially our children’s lives, and our grandchildren’s lives. Note from a UK activist: Please send this article and the video interview to your Councillors, MP’s, MEP’s & Lords via www.writetothem.com and Theresa May, mayt@parliament.uk, Jeremy Corbyn, corbynj@parliament.uk. Dr. Eric Karlstrom and I honored the immense work and voice for humanity that Dr. Rauni Luukanen-Kilde, former Chief Medical Officer for Finland, long-time author, public speaker, and activist has gifted us, with her numerous books, articles, and video talks and interviews on the diverse subjects of DEWs, mind control weapons, microchip technologies, worldwide EMF control grids, Intelligence agency and secretive military predation on humanity, UFOs and ETs, other dimensional realities, eternity of the soul, parapsychology, and life after death. Foremost scientific whistleblower on the use of DEWs, mind-control weapons and micro/nanochips on human populations in the US and Europe, Dr. Kilde traveled widely, experienced much, visited numerous military and medical conferences, researched in-depth, and reported to all continuously and candidly on her experiences, analyses, research, interviews and findings. Taken too soon from us by DEW-inflicted cancer, in her own analysis–as recorded here, at Henning Witte’s White TV site, on Feb 8, 2015, a shining beacon to all who would dare to step forward in these times of abject totalitarianism and speak out to save humanity from ongoing and impending transhumanism, cyborgism, and deletion. 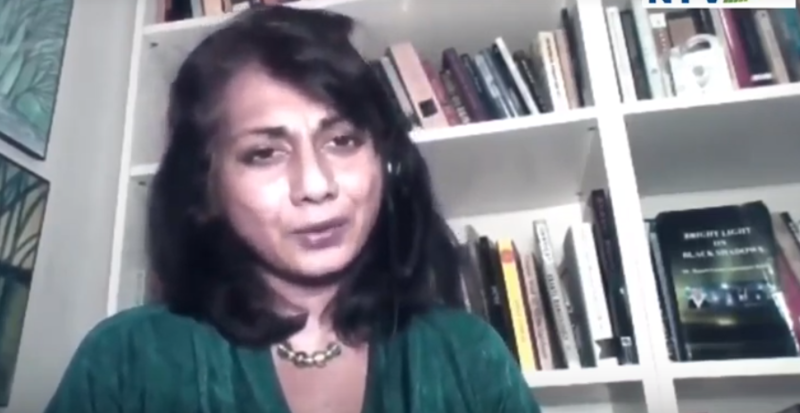 We speak also on the subject of how the attempted global takeover agenda is being rolled out–including on 5G and the Internet of Things, by who, and what targeted whistleblowers can do to help inform all to wake up and stop the totalitarian takeover. “Targeted Individuals” who bear witness to the deadly electromagnetic and sonic weapons being used on all humanity today, are indeed whistleblowers–and the criminal suppression of their voices by a massive Intelligence cover-up to label them delusional, involving mainstream media and bought-and-sold psychiatrists, psychologists, and physicians must be exposed. The fact is, the Age of Nuclear Weapons has given way to the Age of Weapons of Human Manipulation, and the military and Intelligence community who seem to believe they can keep using these weapons in secret forever on humans worldwide don’t want you to know they exist and are in wide-scale use on populations. Please see Dr. Karlstrom’s page https://www.gangstalkingmindcontrolcults.com/dr-rauni-kilde-youtubes-biological-weapons/ for all videos mentioned in our discussion. From Dr. Karlstrom: “Here is the document Dr. Kilde was reading from in the below youtube I sent along and referred to in our GG10…. I already had the document on my website! Note: Global Gestapo is an ongoing series of interviews and discussions with Dr. Eric Karlstrom on a variety of subjects relevant to the understanding of the power structure currently holding humanity captive, the understanding of our own power as individuals in addressing the injustice and technocratic lunacy of our times as we collectively seek to move humanity forward in the direction of freedom for all, justice for all, and evolving creativity, growth, harmony, and consciousness. 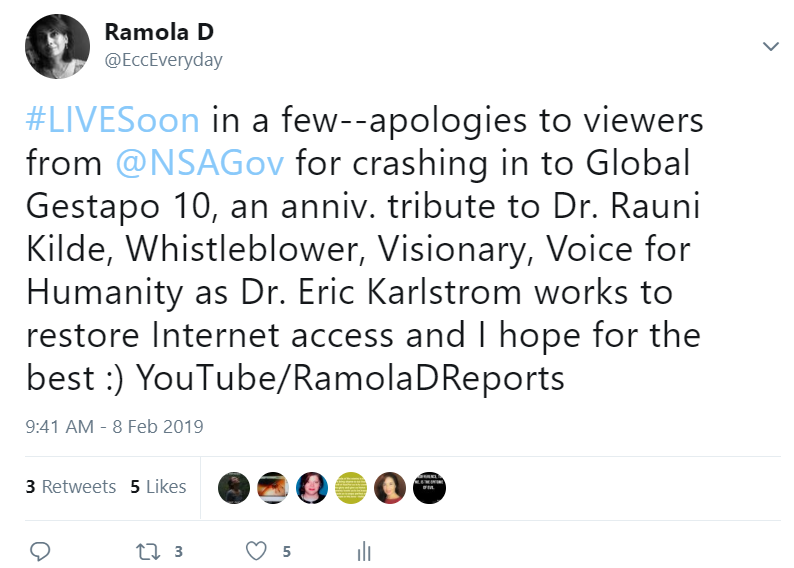 Livestreams announced a few moments before start at my Twitter site, @EccEveryday; not really planned on a regular basis thanks to cyberhacking but you can subscribe to Ramola D Reports at Youtube, which will notify you when livestreams start. In a broadcast honoring Dr. Kilde aired on February 8, Dr. Eric Karlstrom was also interviewed on Polish TV station, NTV, by Ewa Pawela and station owner Janusz Zagorskimain with translator Maria Dominguez on various aspects of the current world situation including the intended 5G rollout, HAARP, and Mind Control covered by Dr. Kilde and also many broadcasters and researchers today. Dr. Karlstrom, an Emeritus Professor of Geography with 30 years of experience teaching Physical and Environmental Geography, who retired from California State University, runs a plethora of True-Media websites with compendiously researched and synthesized information on such pressing matters of note such as the truth behind the massacres effected by the 9/11 destruction of the Twin Towers in 2001, the truth behind the chimera of Global Warming now morphed into the chimera of Climate Change, the truth behind the insidious New Age movement, the truth behind the phenomenon of “Targeted Individuals,” the truth behind the mass assault on humanity with Mind Control weapons, ELFs, neuroweapons, DEWs, and the truth behind the Globalist Agendas 21/2030 and the technocratic takeover of humanity. These websites include 911nwo.org, naturalclimatechange.org, and gangstalkingmindcontrolcults.com. “ETK (Webmaster) Introduction: Ewa Pawela, the mainstay of “MindControl in Poland,” together with NTV television owner, Janusz Zagórskimain, organize the International Day Against Mind Control on 8 February of every year to commemorate the 4th anniversary of the death/murder of Dr. Rauni Kilde, Finnish medical doctor, author, “Targeted Individual” (TI), and tireless educator and advocate for the rights of Targeted Individuals. This year, Ewa asked me to participate in honoring Dr. Kilde by doing this interview. The topics they wanted to cover were mind control, HAARP, and 5 G.
TJanusz Zagórskimain conducted the interview and it was broadcast in both English and Polish on Feb. 8, 2019, with Maria Dominguez translating. Outstanding in this interview is the detailed information Dr. Karlstrom shares about the many researchers and scientists and whistleblowers today alerting all about the dangers of 5G, the use of DEWs on all as for instance in the creation of the California fires, the great danger that humanity faces mutually in the continued and secretive roll-out of mind control weapons, and the great need for all waking up to these dangers–leveled against humanity by the corrupt, globalist coterie running shadow governments behind our de facto governments–to start acting together to protect humanity, a theme echoed as well in Global Gestapo 10. Last year, on the Third International Day Against Mind Control, I was pleased to offer my own video tribute to Dr. Kilde, along with others, publishing also my own experience of being extrajudicially and illegally targeted by the corrupt and criminal Fusion Center mechanism running Communist and Stasi operations in the USA today, all under insidious cover of “National Security” counter-intelligence and counter-terrorism actions which are in truth merely attacking people of integrity, whistleblowers, activists, journalists, and anyone who crosses the path of a local criminal in power in New Phoenix operations which need to be thoroughly exposed and terminated, if the USA and humanity are to survive. 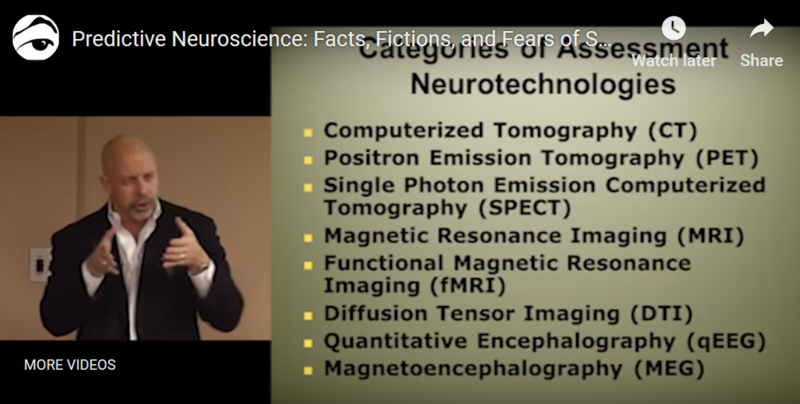 I recommend this video in particular for the excellent interview NTV conducted with Dr. Robert Duncan on the state of affairs regarding these neurotechnologies, how they have been rolled out, and the position that humanity is in regarding their use today. Geral Sosbee, intrepid FBI whistleblower, former English professor, Vietnam War veteran, attorney, and judge alerts us to the incredible corruption rampant today at the FBI and crimes being committed by the FBI on US and world populations, part of the roster of Surveillance Abuses now being enacted, it appears, by the whole slew of Intelligence agencies, local Law Enforcement, and military parties operating with impunity through Fusion Centers in the US, UK, and worldwide—and being covered up with Blanket-Ridicule-Coverage by mainstream media such as The New York Times and Washington Post, Wired, VICE, Daily Beast, and other Rothschild-run media outlets. In Mr. Sosbee’s estimation, the FBI in particular is responsible for these modern-day Targeting crimes, but of course each of these other parties no doubt also play a prominent part in wrongfully watch-listing and terror-listing innocent citizens in order to secretively and unashamedly enroll them in horrific, criminal, and unethical non-consensual human subject experimentation, weapons-testing and medical and University research involving RFIDs, WBANs, medical implants, neuro-implants, neuroweapons, nanoweapons, bio-sensors, aerosols, irradiation with microwave and milliwave weapons, lasers, masers, and so on, as well as Satanic neurotechnology such as V2K, synthetic telepathy, induced dreams, pumped-in videos and images, RHIC-EDOM, EEG Heterodyning, EEG Cloning, brain computer interface (BCI) technology, neural interface technology, and “neuro behavior modification” technology involving RF weapons, while also subjecting them to “bio-behavioral research” involving sanctioned Psychological Operations or Psychiatric Warfare on them. 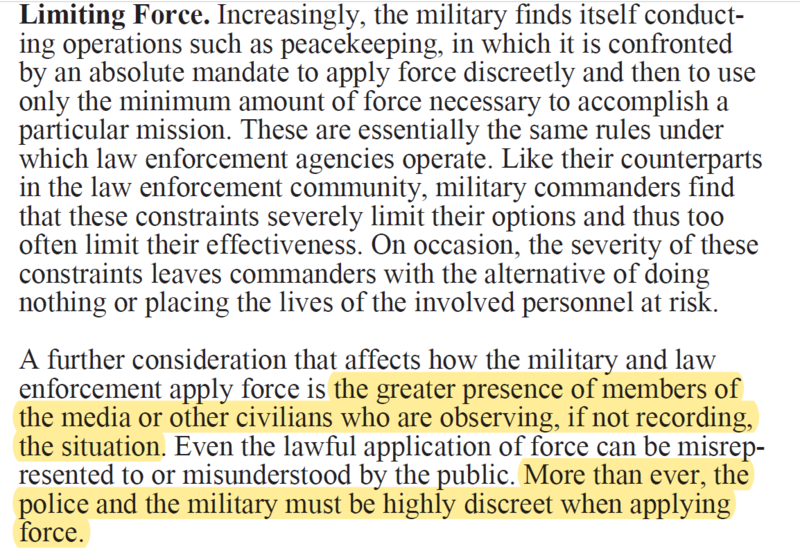 Complaining DOD/DOJ/CIA/DARPA/NIH experimentees are quickly hauled off on 302 Holds to Psychiatric Wards for force-medication and fraudulent-diagnoses, churned out by either complicit or ignorant psychiatrists unfamiliar with modern military RF neurotechnology or Stasi operations of “community policing” involving neighborhood harassment and large-scale organized stalking. Society has been stripped of organic community today; FBI and DHS and other Fusion Center “police” have succeeded in deceiving communities into scapegoating, isolating, attacking, slandering, defaming, and ostracizing targets–who are usually highly educated, highly moral, highly accomplished, and community-minded and civic-minded people whom the current “New World Order” run by apron-wearing Freemasons and hand-signaling death-oathtakers from Skull-and-Bones, Opus Dei, Knights of Malta and other corrupt and criminal secret societies ensconced now inside private corporations, local and federal governments, and spy agencies particularly wishes to silence. Mr. Sosbee himself is being subjected to ongoing persecution of this nature, and has reported physical assault being levied at him by members of his community in public, provocations to which he carefully refrains from reacting, since, as he and many others report, it is this precise Provoke-Harass-Induce Reaction cycle which the Global Gestapo continually use that is designed to Incarcerate or Psych-Commit via a provoked reaction from the target. The tragedy of course is that most people remain oblivious to these horrific ongoing abuses and violations of rights, thanks to the determined Propaganda Campaign run endlessly by amoral, spineless, ethics-less spy-agency-subservient media. The witness testimonial of all targets therefore, and in particular the words and witness of whistleblowers with insider experience of FBI, CIA, and NSA foibles such as Geral Sosbee, Barbara Hartwell, and Karen Melton-Stewart becomes especially important. 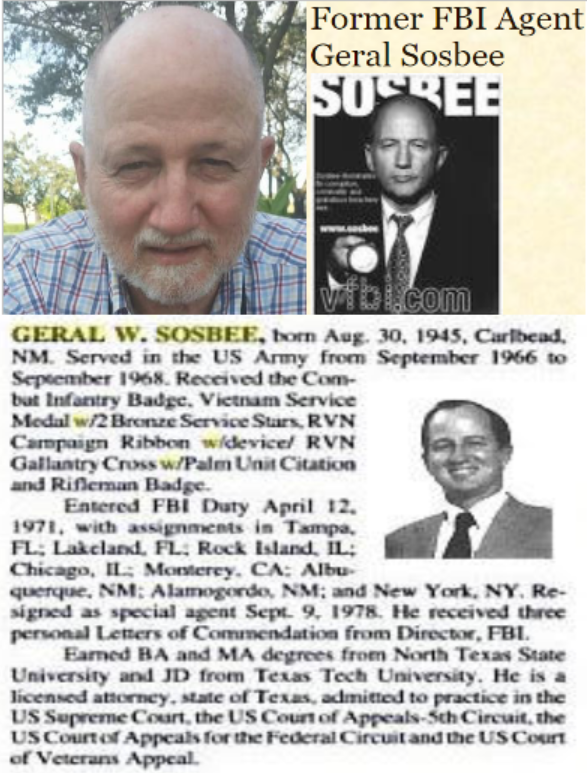 Many thanks to Geral Sosbee for his unswerving integrity and candor in speaking out to alert all humanity, before it is too late. 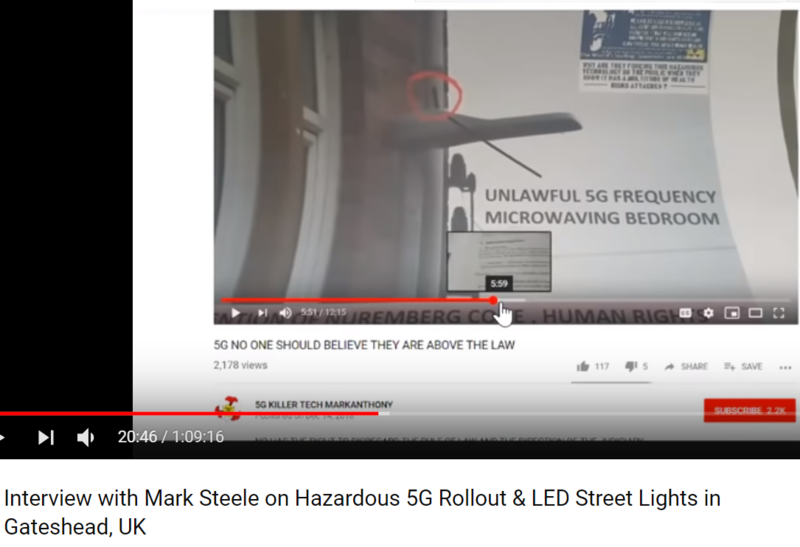 Of course it may be too late already—people are actually being tortured to death with these being-kept-secret-with-a-vengeance EMF, RF, Scalar, Sonic, Neuro/DEW technologies today—but Geral Sosbee’s speaking out will hopefully alert all reading to the actual fact and reality of these crimes and abuses. These agencies and militaries and Universities and hospitals absolutely have to be stopped in their tracks in these deadly and barbaric programs of human rights abuse—but people of conscience, morality, and integrity perhaps need to understand the truth of what is going on first. We are living through an extreme holocaust involving the use of stealth weaponry and social sabotage, worldwide–which needs to be fully exposed and fully stopped. Please share this information widely. Geral Sosbee’s “The Issue” was posted first at Academia.edu and is re-posted here with permission. 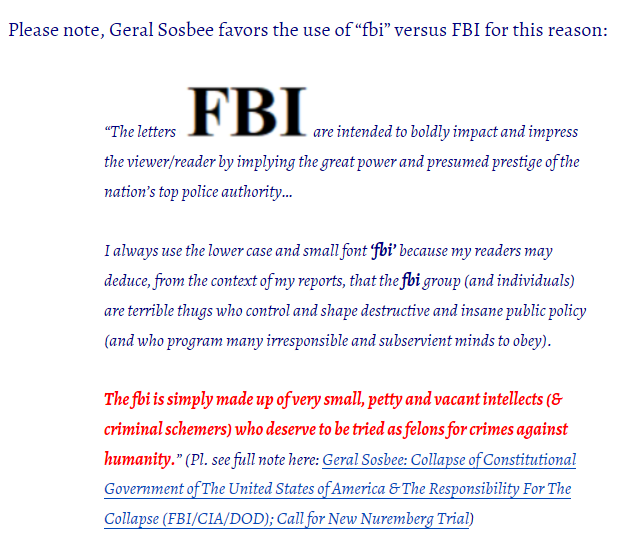 Please note, Geral Sosbee refers to the FBI always as “fbi” for reasons spelled out in an earlier post, here. Abstract: This paper presents an historical perspective on the profound corruption of law and society of the USA by J. Edgar Hoover and his offspring, the fbi. During the unstoppable rise to power of fbi, J. Edgar Hoover (JEH) and universal fascist indications, especially during the roaring ’20s and the sorrowful Depression of the decade, from 1929-1939 (and continuing at the speed of light today), JEH was behind the curtain gathering and exercising brutal authority at the national, state and local levels. JEH understood the meaning of fascism and nationalism by watching events in the ’30s & ’40s regarding threats by Nazis, Communism and attack on Pearl Harbor. He knew that power must be violently forged in international politics, war, and in standards for domestic rule. JEH exploited all such threats on USA to consolidate his grip on media and all of society. In essence JEH was a “Master of Deceit” who developed secret operations and technology to control his Targets. See my reports on psychological operations, gaslighting, and the use of chemical and biological attacks on selected individuals such as me. The COINTELPRO also sprang up to further lay the foundation for destroying privacy; and the use of deep-space-based weaponry became the secret tool by which later fbi operations would torture, maim and kill adversaries. JEH was born in 1895, bacame director of fbi in 1921 & 1924, and died in 1972. The overriding objectives during his life were to control the population and to foster extreme nationalism. After all, such goals also brought success to the most notorious human monsters of his time, Hitler, Mussolini et al. JEH also created the fbi National Academy in 1935 where he and his followers would program all law enforcement officers in USA (and others around the world) in the brutal and often deadly art of control over the population. KILL was the key and was central to all training. Other federal or national groups were also created so as to strengthen the power of JEH and his baby, the fbi. For example, Office of Coordinator of Information (an Intel & propaganda group) in 1941, OSS (Office of Strategic Services) in 1942 (subsequently the cia). JEH gathered other staunch allies who shared his views on power. In 1947 the cia was formed with similar values. NCIC (National Crime Information Center) was created in 1947 when JEH realized the need for a federal (or ‘nationalistic’) system for demonizing Radicals, political enemies, and critics of the national government. 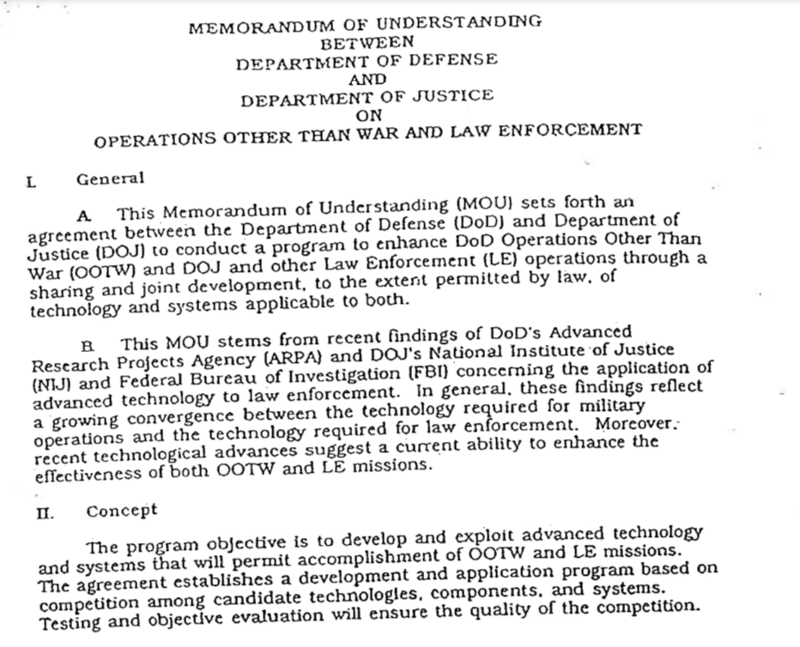 From 1953-1999, the U.S. Information Office gathered and shared war data with fbi and the intelligence community. Today, all Intel groups such as military, doj, cia, STATE DEPARTMENT, Congress, etc., follow fbi ‘s directives toward and for benefit of nationalistic control of the world (viz: NWO). See also my report on the *collapse of the constitutional government of USA and other documentations on fbi use of Directed Energy Weaponry against me and others globally. A few men challenged JEH’s unrivalled rise to power: MARTIN LUTHER KING, JOHN F KENNEDY, et al. They were murdered. I was born in 1945, served in US ARMY from ’66 – ’68 & fbi from ’71-’78. Soon after JEH appointed me as Special Agent, his cadre of ‘True Believers’ began psychological operations against me to discourage my continued service. Ultimately I was forced to quit, but fbi leaves no loose ends. 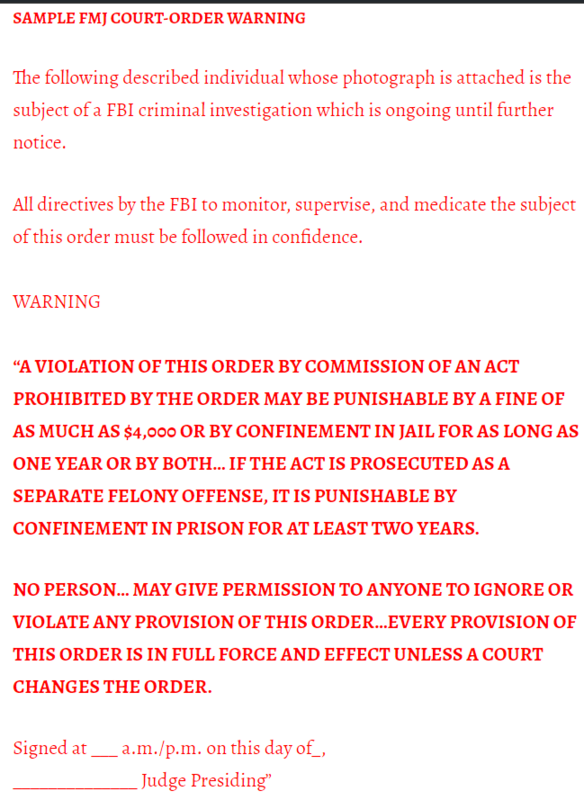 The machinery of fbi’s torture, forced suicide, false imprisonment and assassination program were set in motion to silence me from reporting crimes by fbi. My reports are ‘online’ as is my very existence https://ttu.academia.edu/geralsosbee . Beware of the supreme US authorities who are the fbi and federal judges who program the population and threaten the world, for they are modern-day fascists who use deadly MAFIA tactics and Directed Energy Weaponry to threaten, torture, maim & kill; such extreme measures are unprecedented in human affairs. Current attacks on me by fbi in retaliation include: sleep deprivation by DEW, chemical assaults, physical attacks by fbi operatives, thugs and serial killers, intense psychological operations and gaslighting.